The typical white family had accumulated more than $134,200 in wealth in 2013, while black families scraped together a little more than $11,000 and Hispanic families $13,700, according to a new Urban Institute report. It's yet another example of how financial inequality is pervading this country and it's is only getting worse. 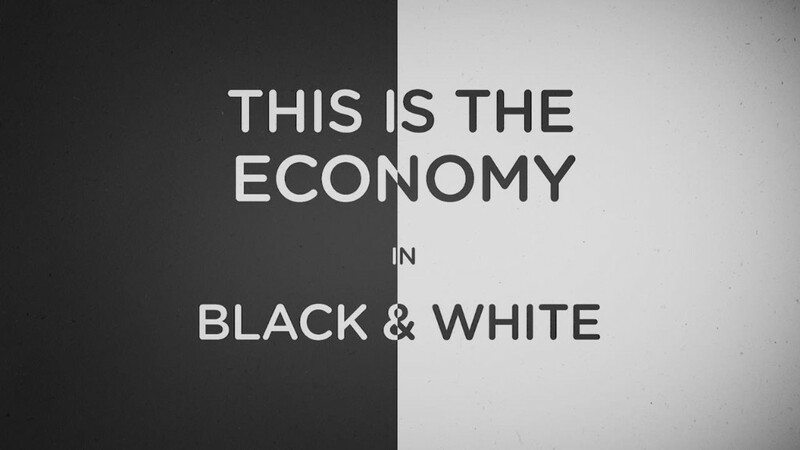 Whites now have 12 times the wealth of blacks and nearly 10 times more than Hispanics. But in 1995, the spread was only 7 times for blacks and 6 times for Hispanics. "The American Dream remains out of reach for many African-American and Hispanic families," said Signe-Mary McKernan, co-director of the Opportunity and Ownership Initiative at the Urban Institute. "Families of color, who will be the future majority population of this country, are not on a firm wealth-building path." There are three main reasons for the widening gap, according to McKernan. Blacks and Hispanics are less likely to be homeowners or participate in retirement accounts, which build wealth. Federal government programs aimed at helping Americans buy homes and save for retirement rely on tax breaks and aren't as available to blacks and Hispanics, who typically have lower incomes. The bottom 20% of taxpayers, in terms of income, received less than 1% of federal subsidies for homeownership or retirement. 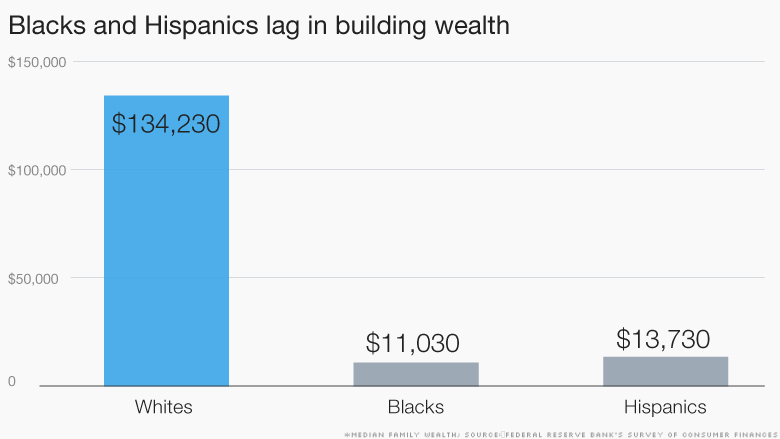 And the earnings gap between the races makes it harder for blacks and Hispanics to save. That means whites are better able to enjoy a comfortable retirement and pass along wealth to the next generation to help children buy homes or grandchildren go to college. Whites are 5 times more likely to receive large gifts or inheritances, said McKernan. 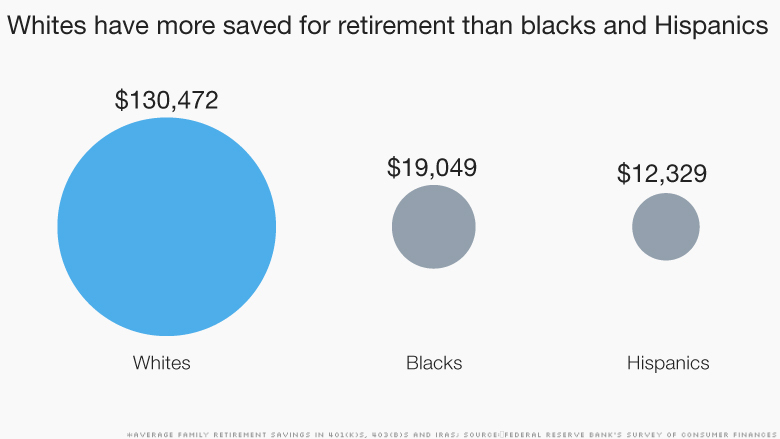 Blacks and Hispanics have also socked away a lot less for retirement in 401(k)s and IRAs. And as these voluntary retirement plans replace pensions, black and Hispanic families are left on shakier ground in what should be their Golden Years. Access is an issue. Some 47% of whites are covered by an employer retirement plan, while only 40% of blacks and 28% of Hispanics are. The latter two are also likely to contribute less when they do have access. 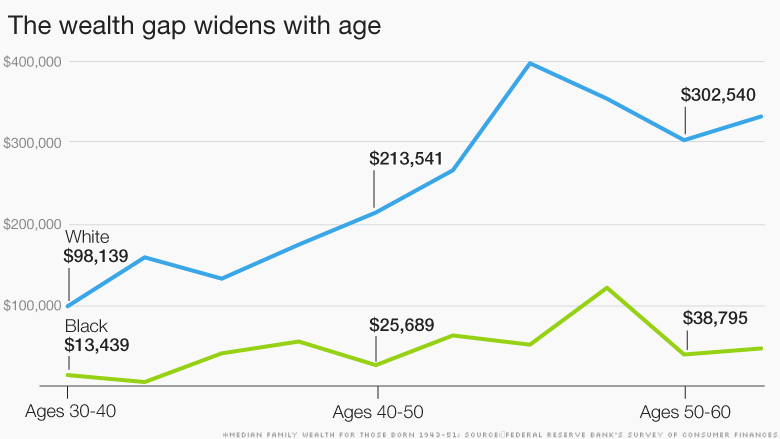 When it comes to building wealth, debt levels also matter. 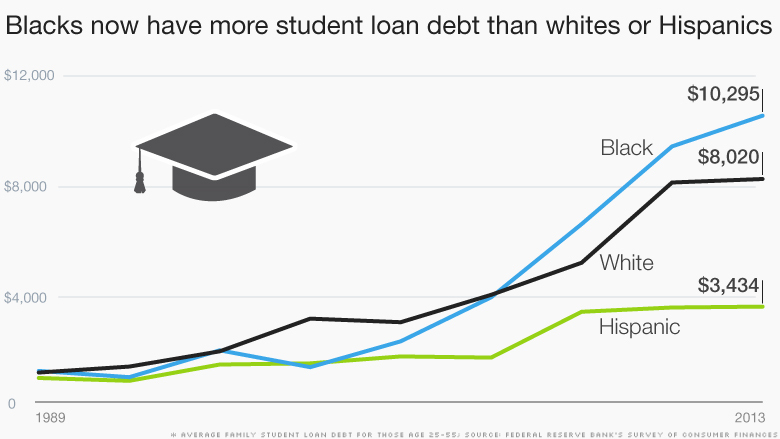 In recent years, blacks have taken on more student loan debt than whites. Some 42% of blacks age 25 to 55 have college loans, compared to 28% of whites. This may be because black families have less wealth so they have to borrow to go to college. But blacks also have lower graduation rates, which leaves them saddled with the loans but without the benefits of a college degree. This hurts their climb up the economic ladder, McKernan said.